Sefer Me’ir Hayim and Sefer Simhat Tzadiq. 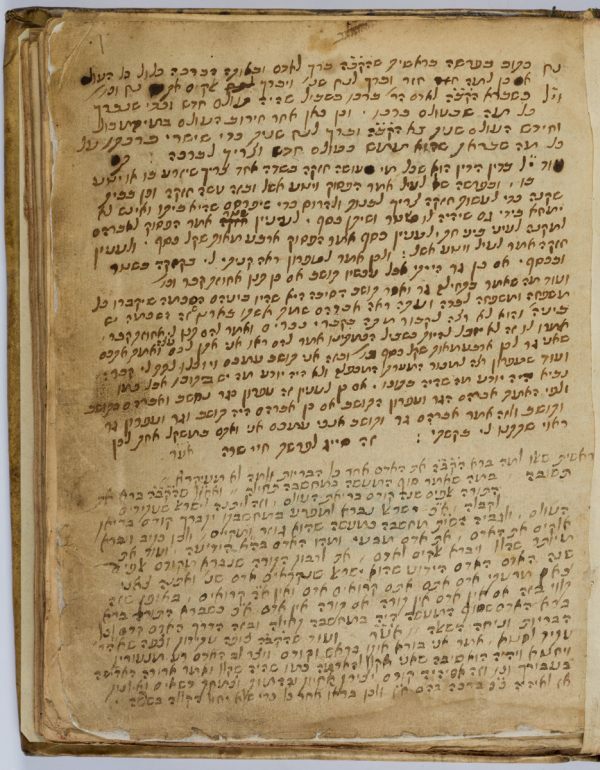 Commentaries in the form of questions and answers on the Pentateuch, Song of Songs, Esther and Lamentations by Meir Hayim (1655-1721) and Zadiq Cohen Belinfante (1675-1750), written by the latter. Amsterdam until 1747. On f. 9v of part II inscriptions: “Ishac de Eliau” and “Is. Delmonte Cohen Belinfante guarde Ds avia”. Between f. 65v and 66r of part II 3 small ll. with notes in the same handwriting are bound with the text. I: f. lr-27v: Sefer Me’ir Hayim, commentary on the Pentateuch by Meir Hayim Cohen Belinfante. f. 3v, 4v, 6r, 7, 8v-9v, 10v, 11v, 12r, 13v, 15, 17v-18v, 19v, 20v, 21v, 23r-24v, 25v, 26v, 27v, 28r: blank. II: Sefer Simhat Tzadiq, commentaries on the Pentateuch, Esther, Song of Songs and Lamentations by Tzadiq Cohen Belinfante. f. 1v, 2r, 5v, 6v, 7r, 11, 18v, 19v, 20v, 22r, 24r, 25r, 26r, 27r, 28v. 29v, 31V, 32v,3 4v, 37r, 45v, 51v, 52v, 55r, 57r, 58v, 76r, 78r-79v, 82v, 83v, 84v, 85v, 88v, 89v, 91v: blank. Hebrew / Paper / 19,1 x 14,9 cm. / 2 parts, I: 28, II: 93 ff. (f. 86 is missing) / Sephardic cursive writing / No title.